No one wishes to be boorish in manners, rude in speech or ugly in spirit; but the most courteous and amiable of persons will find it necessary in their pursuit of truth and righteousness to be offensive to some people. Our Lord Jesus Christ was no exception. Approximately 700 years before his advent, the prophet Isaiah stated that Jesus Christ would be a rock of offense to both of the houses of Israel (Isaiah 8:14). “Unto you therefore which believe he is precious: but unto them which be disobedient, the stone which the builders disallowed, the same is made the head of the corner, and a stone of stumbling and a rock of offense, even to them which stumble at the word, being disobedient: where unto also they were appointed” (1 Peter 2:7-8). To this day, Jesus Christ is offensive to the Jews and also the Gentiles because of their unbelief and disobedience of the gospel. Let us notice some of the occasions in the life of Christ when he offended some people by his life and teaching. To those who came from John the Baptist, inquiring of Jesus as to whether he was the one to come, or should they look for another, Jesus replied by saying, “And blessed is he, whosoever shall not be offended in me” (Matthew 11:6). There is a state of blessedness pronounced upon those who are not offended by Jesus Christ. But many people were denied this blessing even during the lifetime of Christ because they were offended in him. After Jesus had presented a great series of parables concerning the kingdom of heaven, he departed from the area of the Galilean Lake, and came into his own country. After he had taught in their synagogue, the people began to question where Jesus had received so much wisdom, and why he was able to perform such mighty works. They insinuated that he was not worthy of the applause, prominence and prestige which he enjoyed because he was only a carpenter’s son. The implication was that the family had never been known for greatness; and therefore it was inconceivable that Jesus should enjoy such popularity from the people. This indicated that they were very envious of Christ’s popularity with the people. They felt like it belonged to them and not to him. Matthew says, “and they were offended in him” (Matthew 13:57). They were offended in Jesus because he came from a town that was a proverb for lowliness. As one said, “Can any good thing come out of Nazareth?” They were offended in Jesus because of his birth, his lowly place of living, his humble family and trade. Sometimes today the children of God will offend the people of the world because we do not conform to their standards; but we should not worry about this. We should rather worry about offending the God of heaven. “You hypocrites! Well did Isaiah prophesy of you, when he said: This people honors me with their lips, but their heart is far from me; in vain do they worship me, teaching as doctrines the commandments of men” (Matthew 15:7-9 ESV). 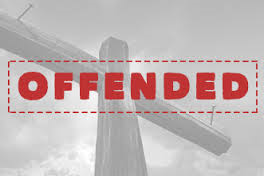 After Jesus had explained to the multitude why it was not necessary for his disciples to wash their hands before they ate, some of the disciples came to Jesus and said, “Do You know that the Pharisees were offended when they heard this saying” (Matthew 15:12)? They were offended because Jesus had exposed their corrupt religion, accused them of usurping the commandments of God by their own traditions and vain worship, because they taught for doctrines the commandments of men. Therefore, they were offended in his teaching the truth of God. It will be necessary today in preaching the plain gospel of Jesus Christ to offend the denominational world with all of its false traditions and doctrines of men. Some do not want plain preaching today. Still we must follow the example of Christ and not those who want to compromise God’s truth. Jesus replied when told that he had been offensive to the scribes and Pharisees, “…every plant which my heavenly father hath not planted shall be rooted up. Let them alone: they are blind leaders of the blind. And if the blind lead the blind, both shall fall into the ditch” Matthew 15:13-14). As Jesus neared the cross, he predicted that even his closest associates, the apostles, would be offended in him. After he had dedicated the Lord’s supper as a memorial of his death, burial and resurrection, he stated to all of his apostles: “…All of you shall be offended because of me this night for it is written, I will smite the Shepherd, and the sheep of the flock shall be scattered abroad” (Matthew 26:31). The cross of Christ is offensive to many people. The apostle Paul later suffered severe persecution because of the offense of the cross of Christ (Galatians 5:11). Let us never be offended in Christ, but let us live in such a way that we please God, and do not offend him.